Your letter reached me with some delay, and I will attempt to answer your questions in their order. With reference to the question of the pronunciation, Ashkenazi or Sefardi, surely you know that there is also Yemenite pronunciation and others. The adherents of each pronunciation of course claim that theirs is the right one. As a matter of fact, in recent times there has been a growing opinion that the Ashkenazi pronunciation is a more authentic one than the Sefardi. At any rate, if you want my opinion as to which pronunciation you should use personally, my answer is that you should not mix pronunciations, at any rate not during the same prayer, or better still not even during the same day. In view of the force of human habit, and especially inasmuch as prayer requires concentration and heartfelt devotion, it would be well to get used to one pronunciation, and to abide by it, at least insofar as prayer is concerned. With regard to the question of leaving one's eyes to an eye-bank after 120 years, or similar bequests, I am of course reluctant to discuss this subject, since this whole matter is of no immediate concern to you at all, inasmuch as you have many many years to live and to fill them with productive and joyful activities, etc. 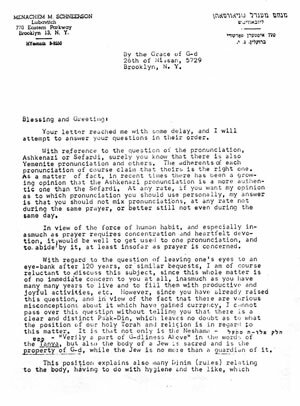 However, since you have already raised this question, and in view of the fact that there are various misconception about it which have gained currency, I cannot pass over this question without telling you that there is a clear and distinct Psak-Din, which leaves no doubt as to what the position of our holy Torah and religion is in regard to this matter. It is that not only is the Neshama - חלק אלו-ה ממעל ממש- "Verily a part of G‑dliness Above" in the words of the Tanya, but also the body of a Jew is sacred and is the property of G‑d, while the Jew is no more than a guardian of it. This position explains also many Dinim (rules) relating to the body, having to do with hygiene and the like, which are also part of our Torah. Thus the Halacha rules explicitly that one must not mutilate, G‑d forbid, something which belongs to G‑d, and which has been placed in the care of a person as guardian and keeper. For the same reason, our Sages of blessed memory have been so strict in the matter of mutilating dead bodies. In those exceptional cases, which are very rare, where an exception was made to the rule, it is because of special reasons, which in no way diminished the sanctity and inviolability of the body, as G‑d's property, but only because under special circumstances, G‑d Himself has permitted certain isolated exceptions, in which case it is the Owners will that is being carried out, namely G‑d's will. Now to refer to your last question in the order of appearance in your letter, though in my opinion it is first and foremost, as well as the most practical one, namely the question of where you should continue your higher learning. 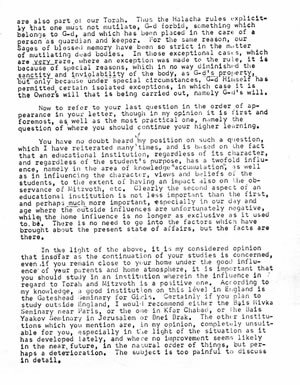 You have no doubt heard my position on such a question, which I have reiterated many times, and is based on the fact that an educational institution, regardless of its character, and regardless of the student's purpose, has a twofold influence, namely in the area of knowledge "accumulation", as well as in influencing the character, views and beliefs of the students, to the extent of having an impact also on the observance of Mitzvoth, etc. Clearly the second aspect of an educational institution is not less important than the first, and perhaps much more important, especially in our day and age where the outside influences are unfortunately negative, while the home influence is no longer as exclusive as it used to be. There is no need to go into the factors which have brought about the present state of affairs, but the facts are there. In the light of the above, it is my considered opinion that insofar as the continuation of your studies is concerned, even, if you remain close to your home under the good influence of your parents and home atmosphere, it is important that you should study in an institution wherein the influence in regard to Torah and Mitzvoth is a positive one. According to my knowledge, a good institution on this level in England is the Gateshead Seminary for Girls. Certainly if you plan to study outside England, I would recommend either the Beis Rivka Seminary near Paris, or the one in Kfar Chabad, or the Beis Yaakov Seminary in Jerusalem or Bnei Brak. The other institutions which you mention are, in my opinion, completely unsuitable for you, especially in the light of the situation as it has developed lately, and where no improvement seems likely in the near future, in the natural order of things, but perhaps deterioration. The subject is too painful to discuss in detail. I wish to add a further point, which I think is also essential. 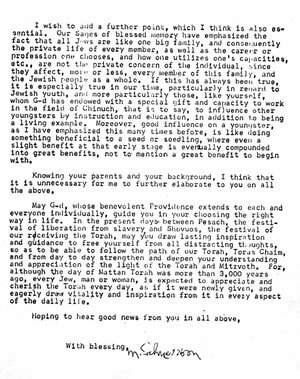 Our Sages of blessed memory have emphasized the fact that all Jews are like one big family, and consequently the private life of every member, as well as the career or profession one chooses, and how one utilizes one's capacities, etc., are not the private concern of the individual, since they affect, more or less, every member of this family, and the Jewish people as a whole. If this has always been true, it is especially true in our time, particularly in regard to Jewish youth, and more particularly those, like yourself, whom G‑d has endowed with a special gift and capacity to work in the field of Chinuch, that is to say, to influence other youngsters by instruction and education, in addition to being a living example. Moreover, good influence on a youngster, as I have emphasized this many times before, is like doing something beneficial to a seed or seedling, where even a slight benefit at that early stage is eventually compounded into great benefits, not to mention a great benefit to begin with. Knowing your parents and your background, I think that it is unnecessary for me to further elaborate to you on all the above. May G‑d, whose benevolent Providence extends to each and every one individually, guide you in your choosing the right way in life. In the present days between Pesach, the festival of liberation from slavery and Shovuos, the festival of our receiving the Torah, may you draw lasting inspiration and guidance to free yourself from all distracting thoughts, so as to be able to follow the path of our Torah, Toras Chaim, and from day to day strengthen and deepen your understanding and appreciation of the light of the Torah and Mitzvoth. For, although the day of Mattan Torah was more than 3,000 years ago, every Jew, man or woman, is expected to appreciate and cherish the Torah every day, as if it were newly given, and eagerly draw vitality and inspiration from it in every aspect of the daily life.